January in KI is normally very hot, with temperatures regularly reaching 45 degrees. However this year by comparison has been extremely mild, averaging around 30 degree. As a consequence it was a perfect time to visit the island, so I jumped at the opportunity. KI is seven times the size of Singapore, and owing to its isolation from the mainland it has retained more than half of its old-growth vegetation. Perfect for visiting as a birdwatcher – and the many pristine beaches and stunning lookouts are perfect for a visiting family. 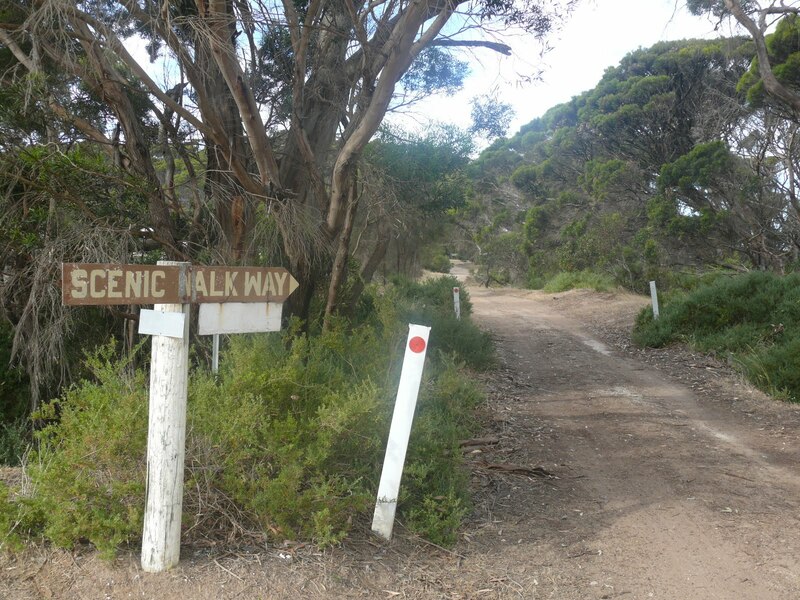 On KI we camped several nights, the first on the banks of Chapman River near Antechamber Bay – a very pleasant river inlet, and an area abounding with birdlife, such as Rainbow Lorikeet, Little Corella and Grey Currawong. We then camped camped at Wheatons Beach on the southern edge of D’Estrees Bay, an area with longs sandy beaches and reefs. 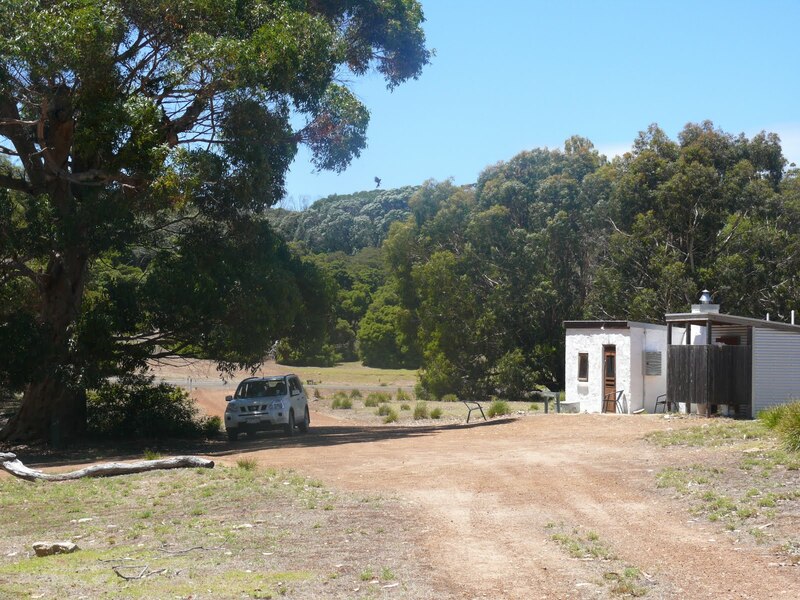 After this we stayed in the Postmans Hut at Flinders Chase National Park. A wonderful (small) sandstone cottage built in the late 1800’s, it has one-room with cooking facilities, a table, three beds (one double, two single) – perfect for a family or couple (unfortunately no showers). Immediately outside the cottage: during the day family groups of Cape Barren Geese fed on the grassy areas surrounding the cottage; while at night Southern Brown Bandicoot, Tammar Wallaby, Kangaroo Island Kangaroo and Brush-tailed Possum fed on a fruiting Kangaroo Apple (Solanum laciniatum) immediately in front of the Cottage, while Southern Boobook and Bush Stone-curkew called in the distance. Wonderful stuff. Highly recommended. The ferry across to the island is very expensive. One of the locals told me it was the most expensive ferry per km in the world. It cost us (with one car, two adults and two kids) nearly $450! It is cheaper if you book online, and it’s worth booking your ticket well in advance, not only to avoid the shock of the price, but it is also a very popular ferry, and you’re not guaranteed a place on the boat. That being said, if you haven’t pre-booked, there is a stand-by waiting area – and you can usually get onto the next available ferry. 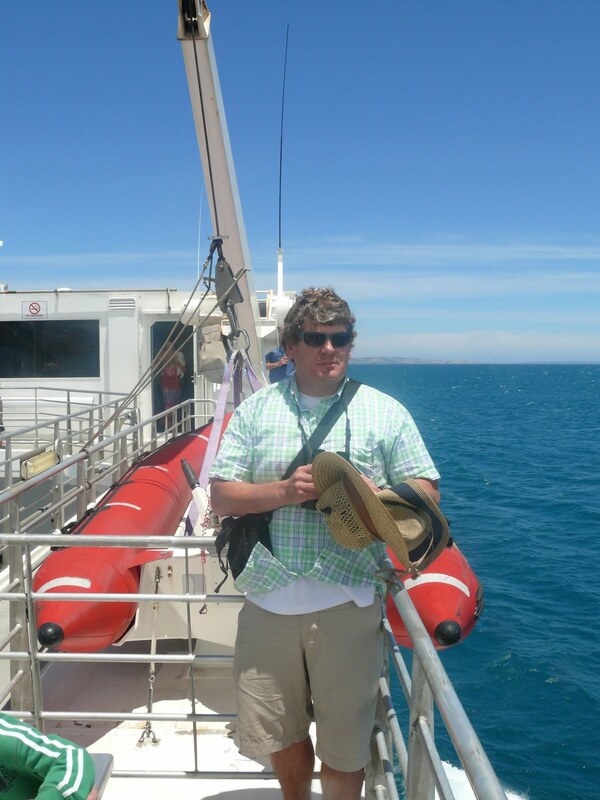 This is what we did (typically not booking ahead), and while we waited (typically) I managed to do a bit of birding around the Penneshaw port area – in the process seeing Eastern Reef Egret, Fairy Penguin, Black-faced Cormorant and a pod of Common Dolphin. Most of the roads on KI are unsealed and often corrugated – except for the islands two main roads (Playford Hwy and South Coast Rd). Although you can get around in a 2WD, some form or 4WD is recommended. We drove our new Xtrail (white, of course) perfect, not just in terms of handling the track, but also in terms of room for camping gear etc. Western Whipbird inhabit the thick shrubland on the southern side of the island dominated by Coastal White Mallee (Eucalyptus diversifolia – also known as Soap Mallee), Dryland Tea-tree or Moonah (Melaleuca lanceolata), with low shrubs such as Boobialla (Myoporum insulare) and Pigface (Carpobrotus rossii). 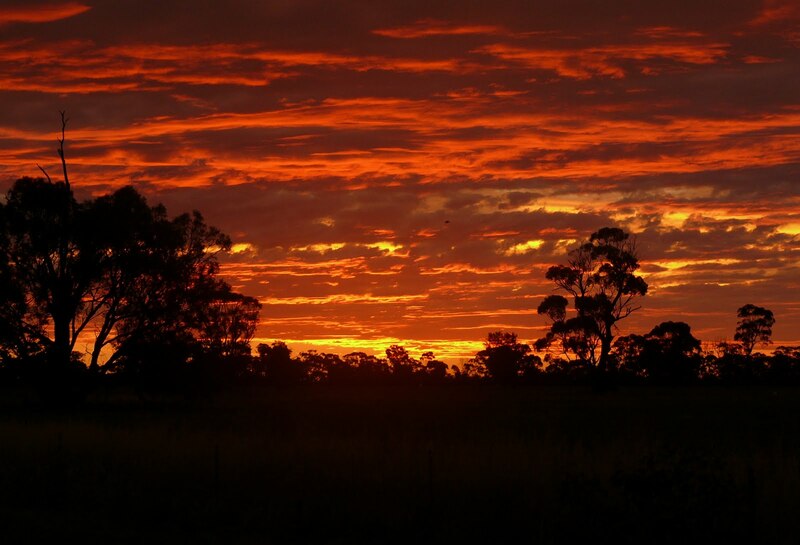 In the east, Kangaroo Island Narrow-Leaf Mallee is the main multi-trunked mallee. 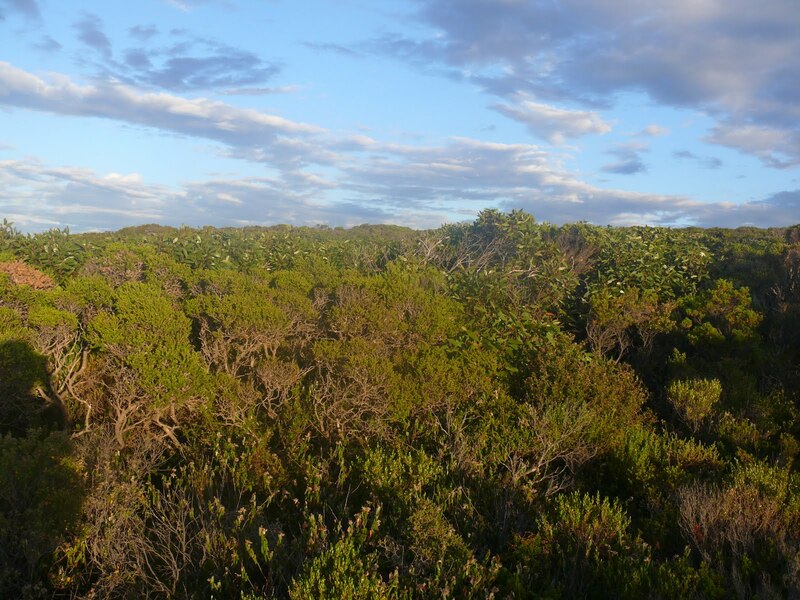 The open woodlands on the island are dominated by eucalypts such as Sugar Gum (Eucalyptus cladocalyx), the main breeding tree for Glossy Black-Cockatoo, South Australian Blue Gum (Eucalyptus leucoxylon ssp. leucoxylon), Cup Gum (Eucalyptus cosmophylla) so named for the large sized gum nuts compared with other species, Brown Stringybark (Eucalyptus baxteri) and River Red Gum (Eucalyptus camaldulensis). There is a wide variety of wattles on KI including Golden Wattle (Acacia pycnantha) and Swamp Wattle (Acacia retinodes ssp. retinodes). Other small trees and large shrubs include the Drooping Sheoak (Allocasuarina verticillata), the major food source for Glossy Black-Cockatoo, Scarlet Bottlebrush (Callistemon macropunctatus), and the slow-growing Tate’s Grass Tree (Xanthorrhea semiplana ssp. tateana). The Xanthorrhea on KI was some of the most impressive I’ve seen – their wonderful round shape dominated the KI landscape. There were a few species that I was particularly targeting including the cryptic Western Whipbird, the endemic race of the Glossy Black-Cockatoo, Rock Parrot and a range of local endemic subspecies. 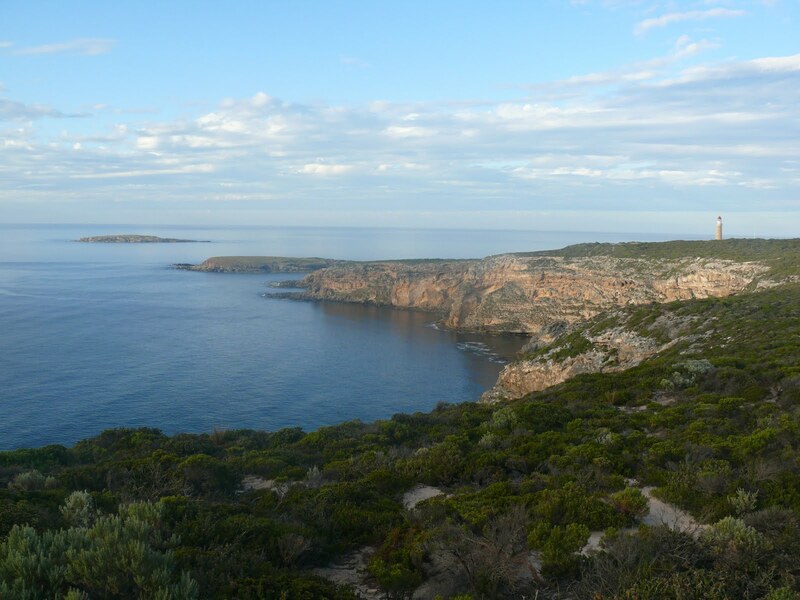 Kangaroo Island is Australia’s third largest island, after Tasmania and Melville Island (in the NT). Like Melville Is, because KI has been isolated from the mainland (for the last 10,000 years) there is a high level of endemism at the subspecies level. Local race endemics include: Grey Currawong (race halmaturina), Crimson Rosella (race melonoptera), Glossy Black-Cockatoo (race halmaturinus), Crescent Honeyeater (race halmaturina), New Holland Honeyeater (race campelli), Purple-gaped Honeyeater (race cratitius) and Western Whipbird race lashmai). 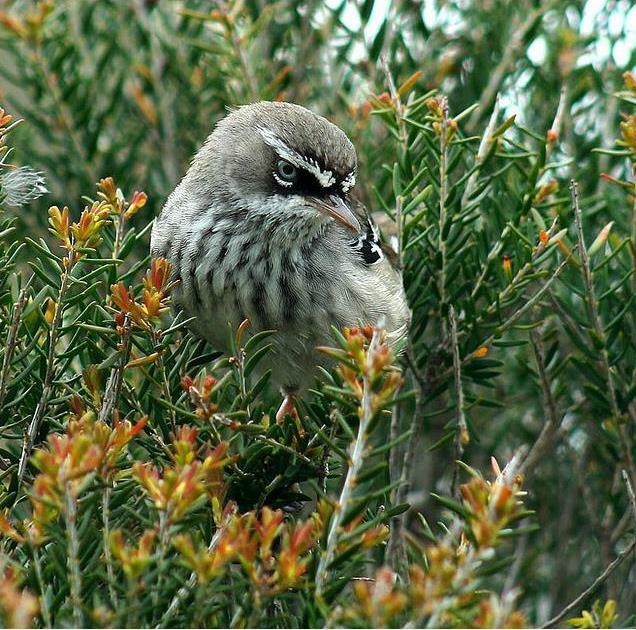 Also there are some interesting introduced species – some Australian endemics but also overseas introduced birds. These include Gang Gang Cockatoo (introduced 1947 and 1956), Cape Barren Goose (introduced between 1923 and 1935, although birds present independent of this introduction), Laughing Kookaburra (introduced 1926, but possibly self introduced), Australian Brush-Turkey (perhaps the most unusual introduction, in 1936 [they were also introduced in Victoria in the Brisbane Ranges]) and Indian Peafowl (introduction date not known). While on the island I also recorded a family of Wild Turkey. These may be a new to the island. The dwarf Kangaroo Island Emu is now extinct (by 1837), however in between 1927 and 1957 the mainland Emu was introduced. All these introduced Emu seem to have gone except for a single bird at Flinders Chase National Park. Crested Pigeon was also introduced in 1937, but didn’t take, perhaps surprisingly, because it’s common 14km east on the mainland. A few major rarities have been recorded on the island including several beach-washed Fiordland Penguin, Antarctic Tern seen off Cape de Couedic Sept 2006 and 2007, Garganey at Murray Lagoon, and a possible Red-tailed Tropicbird. I wasn’t expecting to see any of these. We camped beside the east side of the Chapman River, a really nice camping spot. A number of the larger species were in abundance here, including Purple Swamphen, Grey Currawong (race halmturina, much like ‘Black-winged Currawong’), Little Corella, Rainbow Lorikeet (a bird that seem very different from the Rainbows in Victoria, being small and having a very different call, and going out of a limb, based on no more than simple observation, I’d suggested these are a different subspecies), Yellow-tailed Black-Cockatoo, Galah, Crimson Rosella (slightly bigger and darker race melonoptera, looking more like the nominate race elegans rather than the mainland fluerieuensis ), Grey Shrike-thrush, Black-faced Cuckoo-shrike, and a large female Peregrine Falcon came in several times, chasing Currawong and Corella for breakfast. Also a single Indian Peafowl was seen running across the track near Lashar Conservation Park at Antechamber Bay. Around the campsite there were several Heath Goanna (also known as Rosenberg’s Goanna, and up to 1.5 metres long), so keep your food well stored. On the road into Antechamber Bay we just missed running over a large Black Tiger Snake. 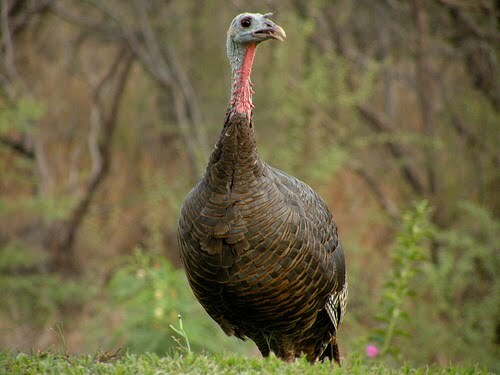 Wild Turkey – a new wild species for Kangaroo Is. We camped here one night. Driving along D’Estrees Bay Rd near Wheatons Beach the first bird I saw was an Osprey. 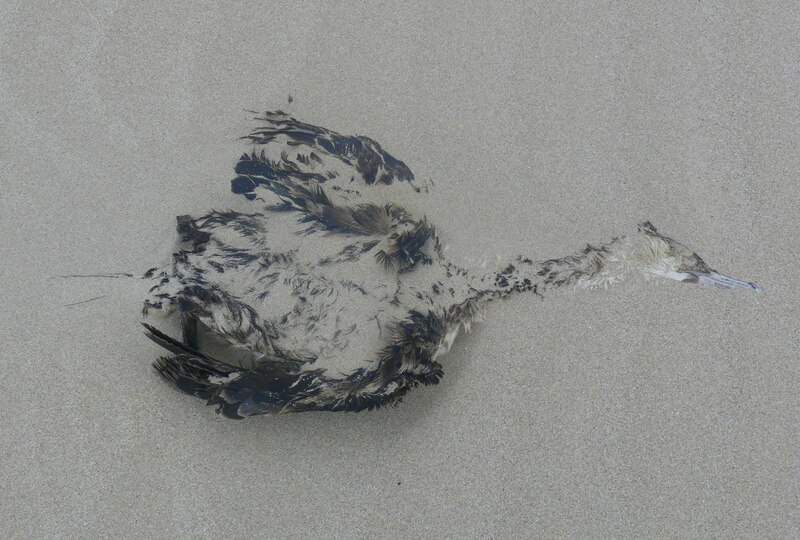 On the beach was a pair of Hooded Plover and a single Eastern Reef Egret. On the small reef at the south end of the beach, waders and terns gathered, including a couple of Ruddy Turnstone, large numbers of Red-necked Stint, Crested and Caspian Tern. Here also the odd Elegant Parrot (with their distinctive golden belly) buzzed across the sky, usually high in the sky. Also here were New Holland (race campelli, with a smaller bill and smaller wings), Crescent and Purple-gaped (race cratitius, larger and darker) Honeyeater. 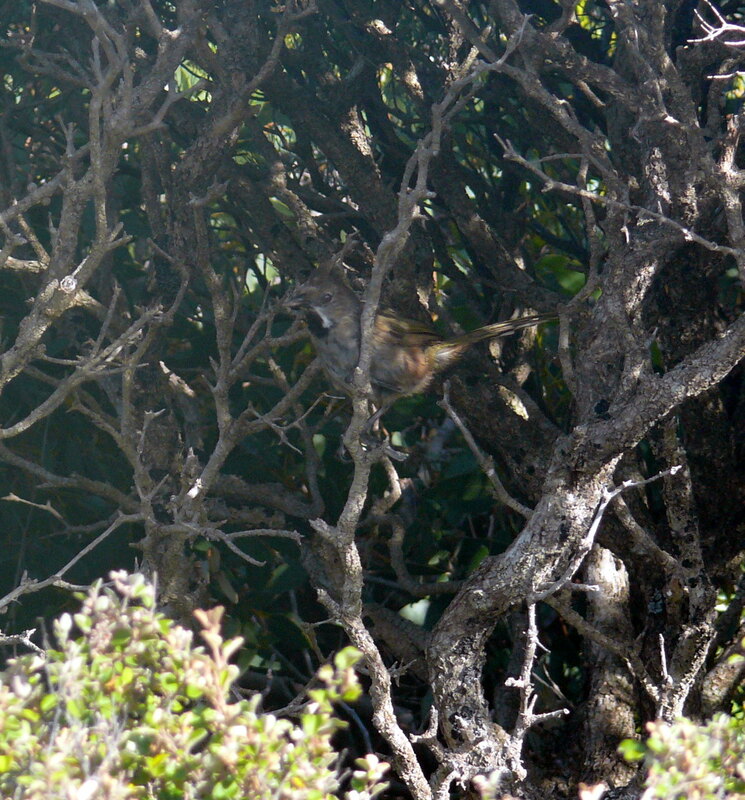 Western Whipbird, Weir Cove Hike – the best photo I could get. Weir Cove for me was the birding highlight of the trip. I was hoping to track down Western Whipbird – a species I was yet to see (initially I was hoping to track this down in sunny Victoria, but this seems unlikely) so drove along Cape Du Couedic Rd to Admiral Arch carpark. 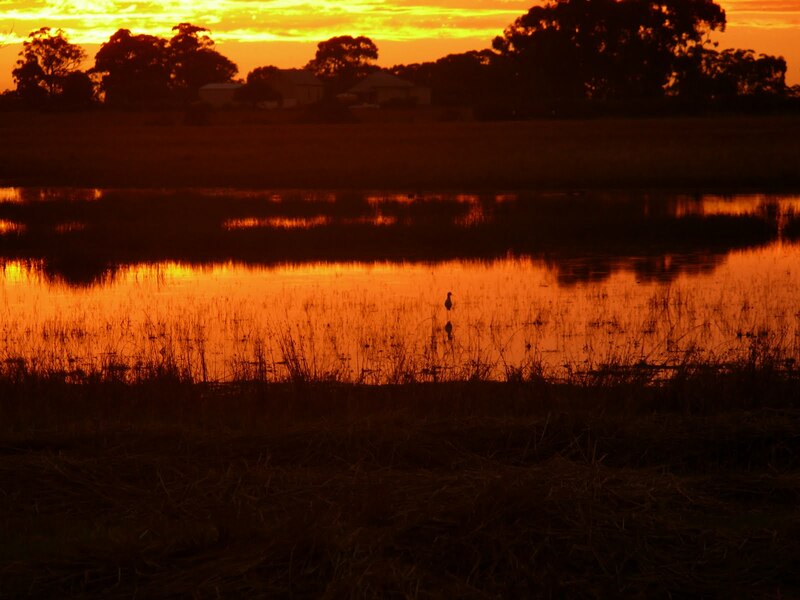 It was early, pre-dawn’ish, and the only things around were Tammar Wallaby and Kangaroo Island Kangaroo; most of the birds were just awakening. At the lookout, I could see New Zealand Fur Seal, a few Australian Lion-seal, a pod of Common Dolphin, Crested Tern, Silver Gull, the odd Pacific Gull, including a few brown immature birds, as well as flocks of Welcome Swallow and Tree Martin. 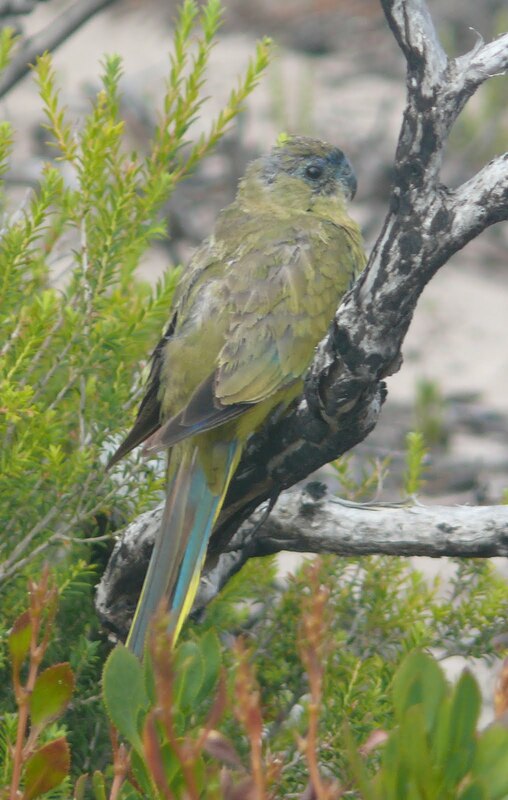 No sign or sound of Western Whipbird so I drove to the Weir Cove carpark, and the first bird I heard as I got out of the car was Rock Parrot; in the heath bordering the carpark there was a flock of 6 birds. 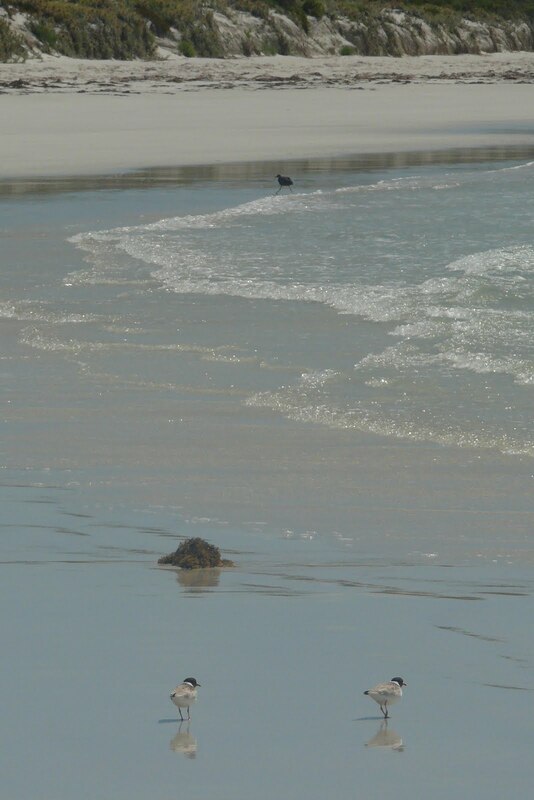 They proved to be surprisingly tame – when flushed they would simply move 20 or so metres and start feeding again. 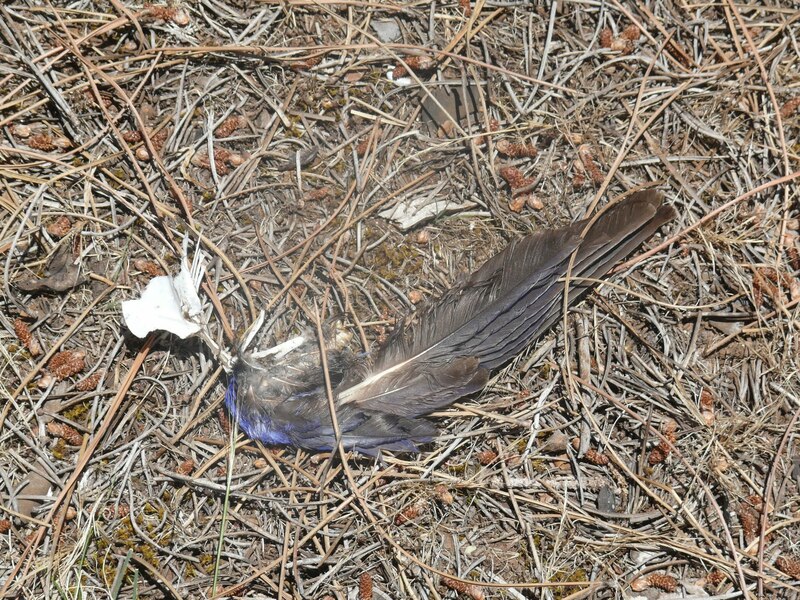 The next bird I heard was Western Whipbird! This was race lashmari, with slightly bigger bill and more undulating call than mainland birds. The birds were calling from a ridge-line about 100 metres from the carpark. Heading north-west along the Weir Cove Hike, to a small rise, from here I could hear a pair of calling in the small valley on the west side of the rise. The scrub here was fairly open, so I was able to position myself near where the birds were calling. After an hour or so of skulking through the scrub, I managed to get some excellent views of this cryptic bird. Also here were Purple-gaped, Crescent and New Holland Honeyeater, Southern Emu-wren, White-browed (‘Spotted Scrubwren’ race maculatus, with streaking on the breast) Scrubwren, Rock Parrot, Brush Bronzewing, Tree Martin, Welcome Swallow and a family of Little Raven followed my every move. Aside from Weir Cove, the habitat along the southern end of Cape Du Couedic Rd was worth investigating. 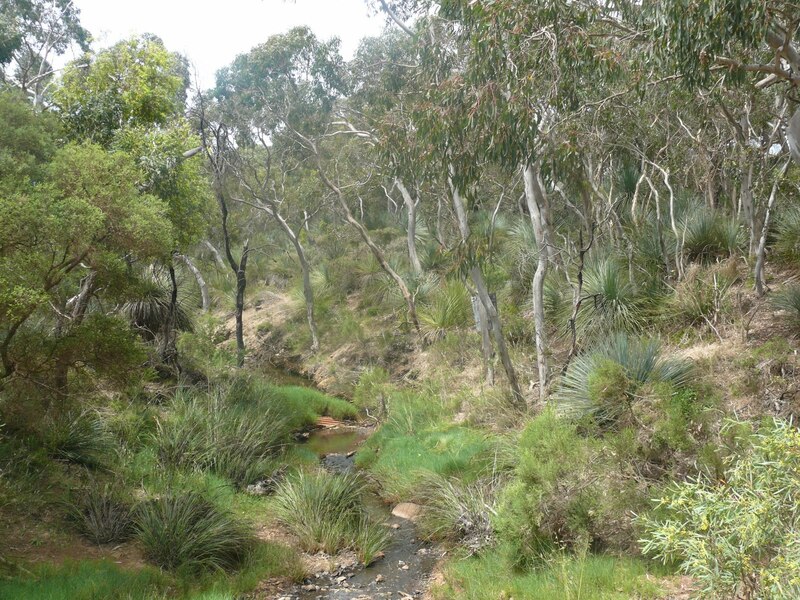 Although I didn’t hear or see Western Whipbird – the habitat was perfect – the roadside was a good place for honeyeaters such as Purple-gaped, Crescent, White-eared and Brown-headed. 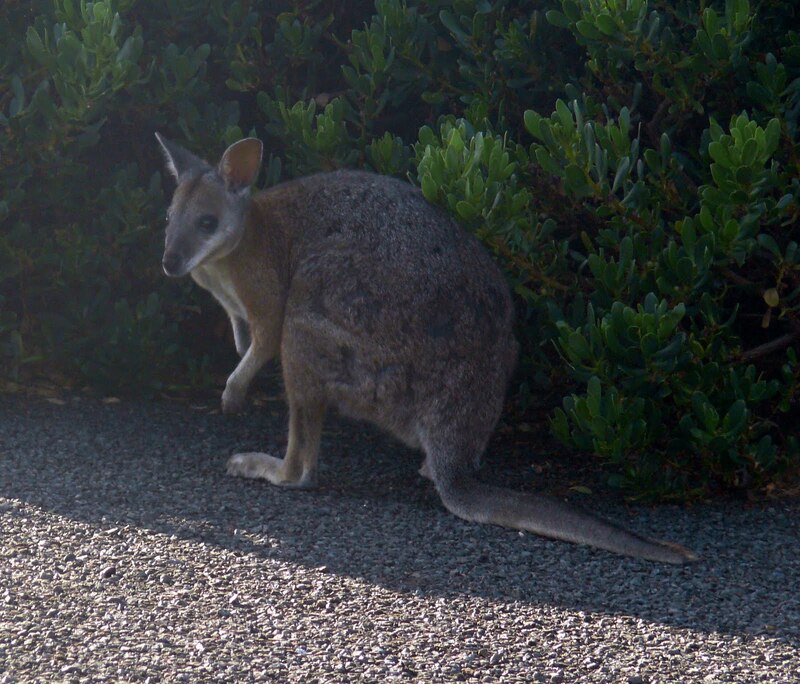 Tammar Wallaby – common at Cape Du Couedic, particularly earlu in the morning. Southern Brown Bandicoot – feeding on Kangaroo Apple at the Postmans Hut, Flinders Chase NP. Common Brushtail Possum – Postmans Cottage. Koala – tame at Duck Lake. 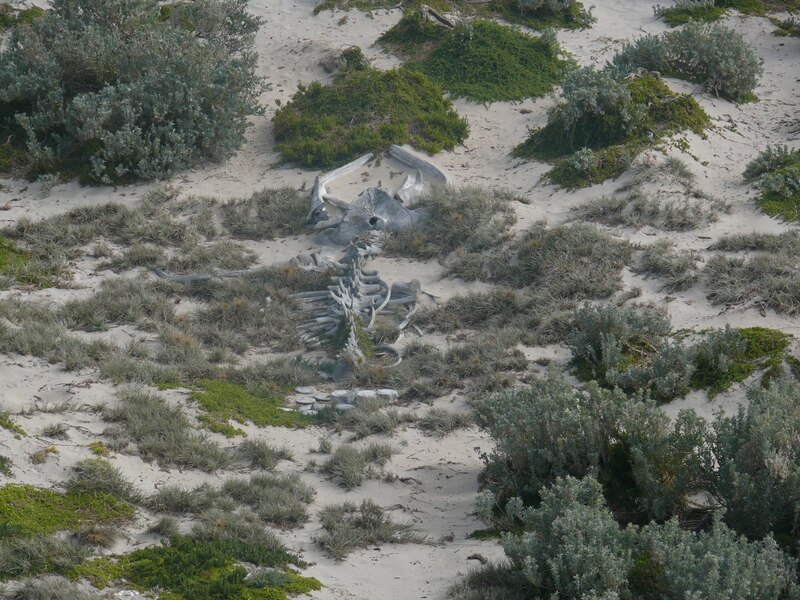 Seal Bay: the area around the carpark is said to be good for Western Whipbird. When I was there, there were literally hundreds of tourists, so birding was limited. It is worth visiting, despite the cost, with Australia’s largest breeding colony of Lion Seals. There were a few areas I didn’t get to visit – such as West Bay, Cape Borda, Stokes Bay, and spending more time as Murray Lagoon. Next time. 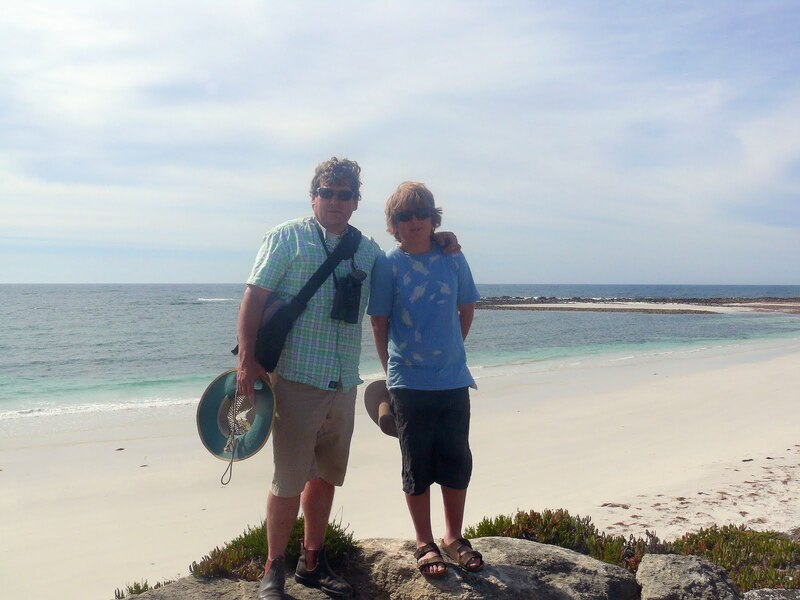 Kangaroo Island – what a brilliant place! 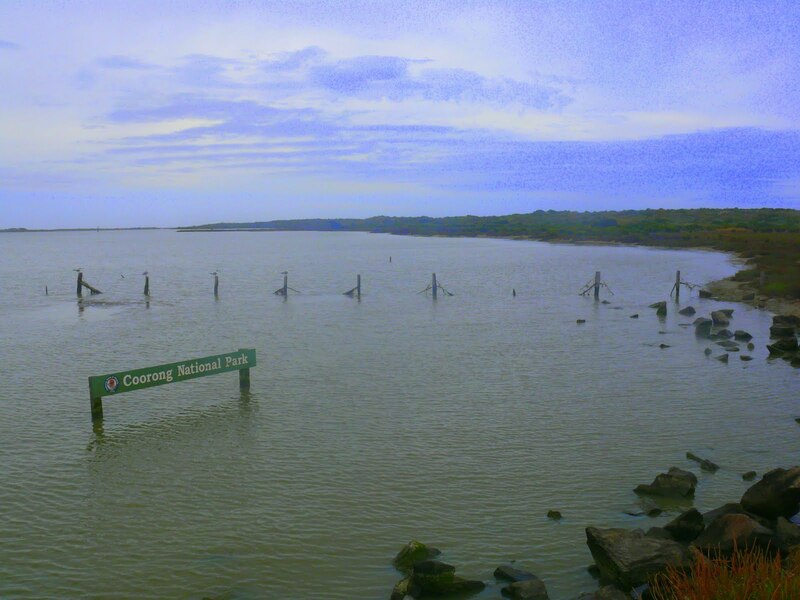 Intrigued to see what the Coorong’s looked like after all the rain travelling down the Murray-Darling river system, on the way home from KI we detoured to Goolwa to visit the Goolwa Barrage and Beacon 19. An excellent site for shorebirds, a number of rarities recorded here including Ruff, Lewin’s Rail, and in May 1987 Australia’s first recorded Citrine Wagtail was seen here. 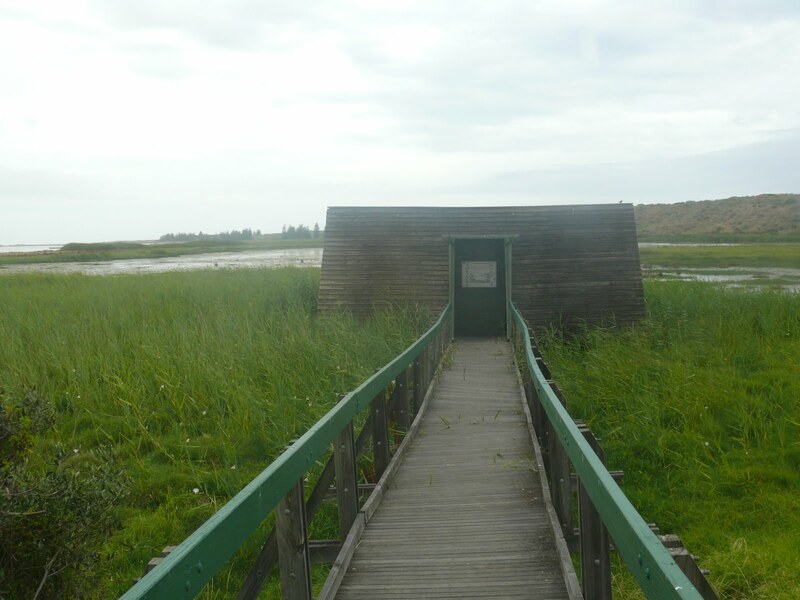 Single Point Birdhide, Goolwa – just before the barrages.